A History of Mosques in Britain by Shahed Saleem – Muslim Museum UK – Uncover the 1400 year relationship between Britain and Islam. Explore the history and heritage of Muslims in Britain. We’ve seen them popping up on the streetscape of every major town and city in Britain, but few people who are not Muslim know anything about the British mosque. Recent high profile mosque controversies have brought this building type to wider attention, but the mosque in Britain has a little-known 120-year history. Current research commissioned by English Heritage is now bringing this history to light, and an architectural narrative of the British mosque is emerging that is entwined with a century of Britain’s architectural movements, from Victorian Orientalism, to Modernism through to Postmodernism and Historicism. This article provides a glimpse of that narrative for the first time. There is no definitive figure for how many mosques there are in Britain today, although the best estimate is in the region of 1,500. Of these, approximately 200 are purpose-built, the rest being either converted houses or other non-residential conversions. The Muslim population of Britain grew incrementally in the years after the second world war, and the spiralling number of mosques reflected this population increase. It’s important to see the mosque in context of other religious architecture in Britain, which tends to be dominated by the church. The English church emerged in the 7th century AD, and until the 16th century acknowledged the authority of the pope in Rome. In the 17th century, dissenting Christian groups emerged outwith the law, until the Toleration Act gave them legal existence in 1689. The Church of England remains the established church with various privileges, but grants religious and civil rights to other Christians and those of other faiths. It is within this aegis, that the mosque in Britain exists today. Apart from Christianity in its various forms, the other religious group to make a substantial impact on the religious architecture of Britain has been Judaism. 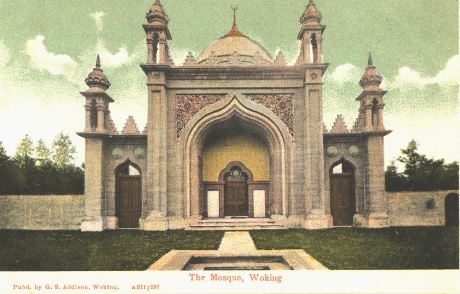 The mosque in Britain, therefore, picked up on this tradition of community-led religious buildings, often built against concerted opposition and through the determination of religious communities, which has been a characteristic of British social and architectural life for some three hundred years. A mosque has an exceptionally simple programme, needing only an open space that is clean, in which people can face Mecca and offer their prayers. Along with running water for ritual ablution before prayer, there is no other spatial, liturgical or sacred requirement. This means that every formal and architectural representation of the mosque we see beyond this is a cultural accretion accumulated across time and culture. This also means that the mosque is a teasingly unrestricted archetype. In theory, it can take on any architectural form and express almost any visual language. What we generally see, however, and especially in the post-war era of mosque building, is the continuous return to known architectural motifs, domes, minarets and pointed arches. One explanation for this is that the mosque in Britain is relied upon to represent the religious and cultural identities of its commissioners in an immediate and assertive way. Post-war Muslim immigration to Britain predominantly brought workers to supply labour to industries across the country. Muslim communities, therefore, emerged in the inner-cities of towns and cities and it is here that Muslim social and religious institutions were subsequently established. As industry declined, these Muslim communities suffered spirals of unemployment, deprivation and discrimination. As grassroots community projects within this context, mosques, apart from serving a primary religious function, have come to represent a certain empowerment of marginalised working class communities who have bypassed the establishment to fashion part of the city in their image. The mosque, therefore, perhaps more than any other building type in our cities today, is intimately connected to social and cultural identities, and presents one of the most nuanced and layered architectural readings around. Furthermore, mosques are perhaps the most contested building type in the city, provoking debate – sometimes fierce – on issues of identity, social change, race, politics, style and taste. This architectural narrative of the mosque offers insights into the genealogy of these debates, shows them to be historical, and suggests where they may go next.